The Tilt framework delineates 12 key character strengths and shows how these strengths are interrelated. Strengths in the same quadrant are strongly related and combine to describe one of four meta-strengths: Resilience, Courage, Wisdom, and Humanity. Strengths in opposite quadrants are counterbalances to each other. There is a common misconception that more is better when it comes to character strengths, but both too much and too little utilization of a character strength can be detrimental. Using character strengths in a balanced way yields positive outcomes, while both overuse and underuse can lead to negative outcomes. (8) Overuse and underuse can be counteracted by having a balanced amount of a strength and the strength shown opposite in the model. For example, overusing integrity can lead to being rigid and unbending, which is detrimental to likability. Likewise, overusing likability and deferring to what everyone else wants is detrimental to integrity. Balance in all 12 character strengths is key for agility. 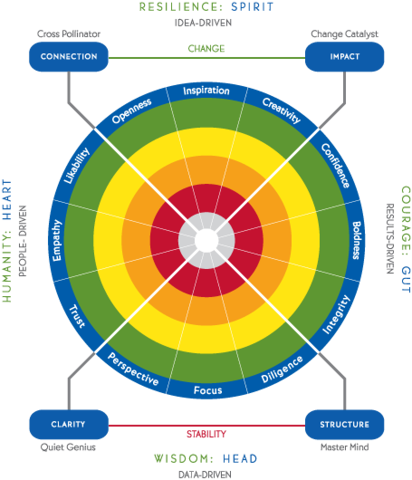 Research using the Tilt Framework has shown that when leaders have balanced character strengths they encourage a team climate conducive to creativity, innovation, and change. This team climate is a necessary precursor for team agility. The True Tilt Profile and the Tilt 365 Positive Influence Predictor have passed rigorous validation procedures and have satisfactory psychometric properties. In addition, the assessments are continuously being revised, improved, and re-evaluated. The technical reports detailing the most recent psychometric evaluations are available in our Knowledge Base. 4. Kiel, F. (2015). Return on character: The real reason leaders and their companies win. Boston, MA: Harvard Business Review Press. Why should I care about Character in business? Finally, Tilt’s research shows that developing balance in the 12 character strengths of the Tilt model transforms team climates to optimize productivity, creativity, and innovation.